If you are ready for some of that kind of straight talk, this will be an enjoyable album for you. Rausch, the band, is made up of Doug Rausch on vocals and piano, Joe Fine on bass, Gary Wehrkamp on guitar and Chris Ruffini on drums. 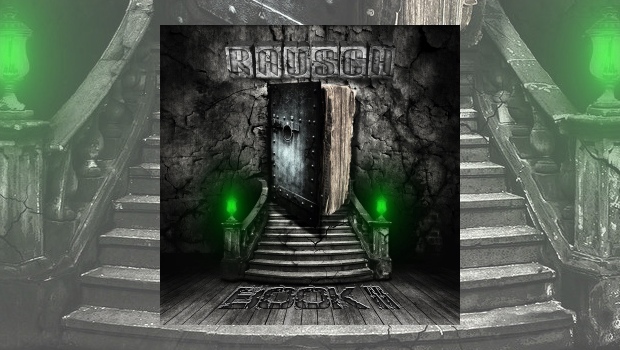 Book II is their second album, following the critically acclaimed debut Rausch released back in 2009, and features guest appearances from Fates Warning drummer Mark Zonder, keyboards from Ryo Okumoto of Spock’s Beard and the guitars of Brendt Allman from Shadow Gallery. I’m not sure who his voice might be compared to, so I will suggest a cross between a young Neil Morse and Mike Patton of Faith No More. As the track moves forward the synths and keyboards take off with full support of bass, kicking drums and soaring lead guitars, turning into a powerful Queen–like musical experience. What a fantastic way to open an album. It’s the excellent piano work, which reminds me so much of early, bluesy Queen. It’s not We Are The Champions, but it’s hard to argue that this song would create some heroic moments if played live in an arena full of rock fans. “I don’t really care anymore. And this is what I meant about Doug’s ability to be brutally honest about how he is feelings, and his fearless lyrical explanation about a state of mind, that we have all felt at one time or another. That piano solo is one of the best musical segments on the album. As Drain builds, Doug comes back with powerful lyrics set initially to acoustic guitar, electric then filling in the sound. An almost Roger Waters’ level Wall portrait! Then the band take it up another notch with the drums, bass and more electric guitar, while the darker piano keys pound in support of the progressively darker lyrics, a solid statement which makes this one of the best tracks on the album and one of the best I have heard this year. An excellent keyboard vibe opens Irked – one which could continue on forever as far as I am concerned, it sounds so good. But as the drums and keyboard work are added, expanding the sound further, another of the great tracks on the album is created. The lyrics are powerful and reflective of what each of us is faced with at some point in our lives. They are so real, so why hasn’t anyone else done this before? Well, they have: John Lennon and Paul McCartney, Tom Waits, Bob Dylan, and Roger Waters, just to name a few, but so few do it anymore. Bluesy guitars mix well with piano and drums, so much unique sounding music you will wonder how this guy has not been all over the radio. As The Beatles once said, “Well, you know, We’re doing what we can”. Yes, I want to do what I can to get the message out that this is a great album. Good Day, is a solid rocker about a good day…when Doug “breaks even”. Solid Queen-like vocal harmonies and great guitar and drums, one of the heaviest songs on the album. Excellent! The End is not the powerful statement that The Doors made, but this is equally unique and memorable. The lyrics are direct and unfiltered; “Somehow I’m still here. Dangling by a string…Surely there has got to be more to life than this.”. The electric guitar solo is unforgettable and the drumming on the ending is out of this world. And…if you close your eyes…you may be able to picture in your mind the napalmed jungles from Apocalypse Now. Time Out is a break in the action after some of the strongest parts of the album. This reminds me of a Beatles–like break that seems necessary amid all the majesty being recorded, like Martha My Dear between Happiness is a Warm Gun and I’m So Tired. But I still appreciated Martha My Dear. Speechless opens with a drum and guitar assault, similar to a wonderful combination of the inspirations from Rush’s Cygnus X-1 or 2112, and Dream Theater’s Pull Me Under. Then Doug lifts off on lead electric guitars and punching drums and bass. Slow Suite: II. Isolation opens with inspired deep piano strokes and Doug singing “Send me another song…God knows where I’m going”. Sometimes, you just need to be alone to create your music and then share it with the world. You really need to hear this album for yourself. It is unique and challenging and when was the last time you heard challenging music? Buy this and play it… I double dog dare you!